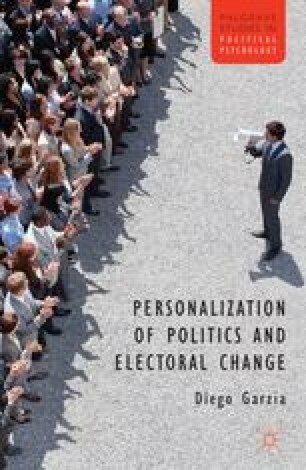 Whether or not the dynamics of parliamentary elections have become more presidential (Mughan, 1993; 2000; Poguntke and Webb, 2005; 2012), it is hard to deny that democratic politics is now more personalized than ever before. Indeed, the “popular focus on leaders now appears commonplace across almost all of the major parliamentary systems, where parties once occupied the center stage” (McAllister, 2007: p. 572). Impressionistic evidence of this trend includes the substitution of leader images for party symbols during election campaigns (Bowler and Farrell, 1992; McAllister, 1996; Swanson and Mancini, 1996; Farrell and Webb, 2000) and the media’s increasing propensity to mention leading candidates rather than the parties they belong to (Dalton, McAllister, and Wattenberg, 2000; Mughan, 2000; Langer, 2007; Karvonen, 2010; Ohr, 2011). Executives themselves are portrayed in a personalized fashion, as they are routinely labeled after the names of their leaders (Bean and Mughan, 1989), and a stronger correlation over time between prime ministerial popularity and the executive’s public rating has been documented in several parliamentary democracies (Lanoue and Headrick, 1994; McAllister, 2003; Campus and Pasquino, 2006).